Traditionally the best criteria for determining if a dancer is ready to go en pointe have been age (12 years old) and good technique, however, recent scientific studies have found that there are many different levels of development and skill in the 12 to 15 year old age group. Many factors can change how an artist develops as a dancer like number of years trained, their commitment to mastering technique, and cross-training. Because there are so many variables in skill level, it is very important to be knowledgeable about what it takes to dance en pointe and to use some great simple exercises to see if dancers are ready. There are several dynamic movement tests for determining pointe readiness. Dynamic movement tests are ways to challenge the body to detect areas that need improvement. Here are the tests for determining if a dancer is ready for pointe work that are most commonly researched in dance science. Point your foot and hold a pencil on top of it lengthwise. 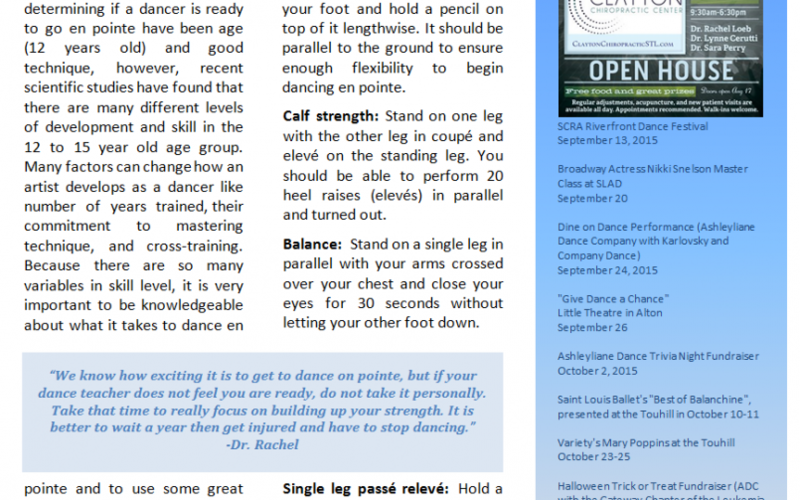 It should be parallel to the ground to ensure enough flexibility to begin dancing en pointe. Stand on one leg with the other leg in coupé and elevé on the standing leg. You should be able to perform 20 heel raises (elevés) in parallel and turned out. Stand on a single leg in parallel with your arms crossed over your chest and close your eyes for 30 seconds without letting your other foot down. Hold a passé position in full elevé for 15 seconds without falling over. Lie on your back on the floor with your legs straight up in the air perpendicular to the floor. Lower your legs until you can no longer hold your lower back to the floor. You must be able to go to 45° (half way) or lower without lifting your low back to pass this test. Stand with one foot on a platform that is approximately 9 inches tall and plié to touch the heel of the other foot to the floor with the hips remaining level and neutral. Repeat 4-5 times with control to pass. Stand on one leg in parallel, bend the torso forward and lift the back leg to create a straight table top appearance with the body. Reach the arms straight in front of the chest toward the ground. Maintain control of the body and do 4 pliés to pass. Perform a single en dehors pirouette from fourth position, landing in fourth position with a fully straight knee and supported passé position with full control. Perform 16 single leg sauté jumps in a row maintaining proper technique, specifically neutral hips and extended knee and foot while in the air, landing toe heel and with an upright torso. 8 of these must be performed with proper technique in order to pass. The best tests for predicting pointe readiness are the airplane test, the single leg sauté test and the topple test. These moves are the most challenging and best indicators of strong technique, core strength and lower extremity strength and function. It is understandable that many students will be anxious and eager to begin dancing en pointe, but without being properly trained and skeletally mature enough to begin, there could be serious consequences of putting a dancer en pointe too early. If weaknesses are found and the dancer is unable to pass these tests, they may need to complete a rehab program to balance out their muscle tone and improve flexibility. Chiropractors can quickly pin point areas in need of rehabilitation and prepare dancers for pointe work at an optimum age. They will also treat any aches and pains associated with the dancer’s training. Regular chiropractic adjustments and muscle work are key to preventing injury and properly preparing young dancers for a successful career with longevity. If you do not think you are ready, our prehab program may be right for you.